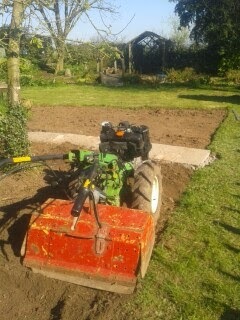 Yesterday I took my large rototvator over to my mums as she has two new large flower beds she wanted turning over. This was after I struggled for an hour on Friday night trying to start the bloody thing to get it in the van of course! Anyway I unloaded it off the van and I took the machine over to the garden and tried it on an area where the turf had been lifted. It skidded on the top and sent me flying up the garden, so I left it idling in neutral to go and ask advice. When I came walking back up the the garden I could hear the sound was coming from a different place, I broke into a sprint - The rotovator had slipped into gear and was pushing against the bridge over the stream. 6" either way and it would have been a different story! It had worn the grass away under the wheels from where it was trying to make it's way forward, unbelievably lucky. If it had gone in the drink I think I would have done a runner as mum is very protective over her stream! All they would have seen of me would have been the back of the van as it went up the drive! I told mum about it later and although she laughed, I'm sure she was thinking what she would have done to me if it had wrecked her stream. Anyone else had a near thing with a runaway machine? Yeah, it could have been a lot worse. I wouldn't be laughing if it had gone in the brook! Hubby ripped up our lawn last week, he struggled with a friends rotovator, but much better than digging, now all we have to do is lay the new turf. They're a good tool. I just couldn't get this one to hold back so we made a spike for it to dig in and try to hole it back a little bit. Sounds like a scene from 'The Good Life'. I think much of my life does sometimes! I have had a few runaway tractor moments. Oh and bullocks jumping about in my potatoes and the time I put a lasso around a supposedly ill heifer and she dragged me round the field. Rotovators are great for hitting roots and going walk/run about. I don't rotovate in weedy areas because they make millions of weed plants. they sure do run away when they hit something. I need to get a stop fitted to this really as I'm not sure I could catch it. This area had been down to grass for twenty five years (they had grown potatoes here once before then) so hopefully not too many weeds. That machine must be possessed by evil spirits. Time to exorcise it with a proper electric starter so you are not hesitant to shut it down. I think it laughs at me when it sees me coming! That did make me laugh! Reminded me of when my dear OH was pinned up against the shed by an old rotavator he just managed to get working, but he couldn't turn it off! I bet he didn't laugh at the time! They're powerful machines and like Michael says this one might be possessed! I've never had an experience like that, but I'm glad your equipment didn't plummet into the stream. Yeah, I brought this Rotavator with the money from my first years hay here. It might be a bit big for me really but it does a good job when I can control it. I was once cutting hay next to a major Oregon highway. I had the rope you pull to unlatch the tongue so you can swing it between road and field position hook to the seat tension adjuster. I unhooked the mower but forgot the rope. When I drove away it pulled me and the seat off the back. I picked myself up and chased the tractor down before it reached the highway. Then I looked around to see if anyone saw me. Much more careful about that rope. That would have been great to watch but one of those moments where it could have ended very differently. I've few near misses that I shudder to think about - many involving a tractor! Many years ago I lived in a house with a driveway that was on a slight hill. My husband had left the car in the drive, but had not set the parking brake. I glanced out the window to see the car rolling backward. It had crossed the street and was on its way down the little hill of the neighbor's front yard. Headed toward the neighbor's house. My husband shot out the front door as if expelled from a cannon, managed to catch the car and hit the brake before the car reached the house. Coming back inside my husband, who was a fairly large man, remarked that a fat man can move pretty fast when scared. I love his comment at the end! I bet you laughed afterwards! Brilliant! well that certainly was exciting! Only with the way it ended up! If it had gone in the pond you'd be leaving condolences on here! We hired one,it ran away with me still holding on,it was far too heavy for me. It stopped when it tipped us both over. We bought a small one! I have a small one as well (Rotovator that is)! Much easier to handle but thsi one is great for big areas. The first time I used it the thing pulled me over the wheel barrow and into the fence! Not fun! What to do with Sawdust?